Definitions of most terms used here are provided in the IETF SFC Architecture RFC. Additional terms specific to the OPNFV SFC project are defined below. This section outlines the Brahmaputra use cases driving the initial OPNFV SFC implementation. The use cases targeted in the OPNFV SFC Brahmaputra release focus on creating simple Service Chains using Firewall Service Functions. As can be seen in the following diagram, 2 service chains are created, each through a different Service Function Firewall. Service Chain 1 will block HTTP, while Service Chain 2 will block SSH. This section describes the architectural approach to incorporating the upstream OpenDaylight (ODL) SFC project into the OPNFV Brahmaputra platform. A Service Function (SF) is a Function that provides services to flows traversing a Service Chain. Examples of typical SFs include: Firewall, NAT, QoS, and DPI. 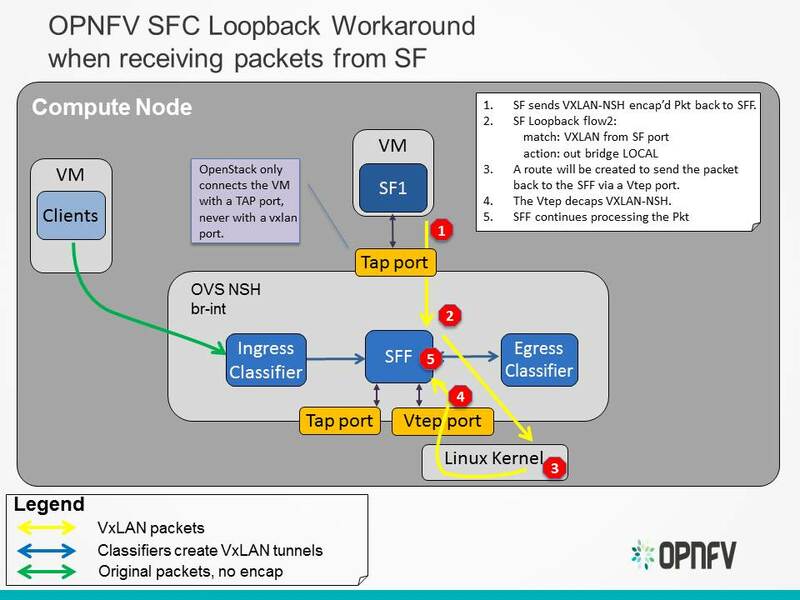 In the context of OPNFV, the SF will be a Virtual Network Function. The SFs receive data packets from a Service Function Forwarder. The Service Function Forwarder (SFF) is the core element used in Service Chaining. It is an OpenFlow switch that, in the context of OPNFV, is hosted in an OVS bridge. In OPNFV there will be one SFF per Compute Node that will be hosted in the “br-int” OpenStack OVS bridge. The responsibility of the SFF is to steer incoming packets to the corresponding Service Function, or to the SFF in the next compute node. 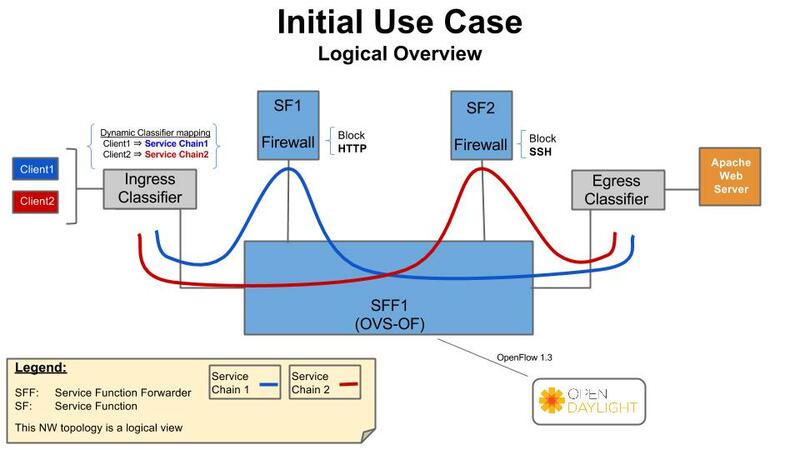 The flows in the SFF are programmed by the OpenDaylight SFC SDN Controller. A Service Function Chain (SFC) is an ordered list of abstract SF types. A Service Function Path (SFP) references an SFC, and optionally provides concrete information about the SFC, like concrete SF instances. If SF instances are not supplied, then the RSP will choose them. A Rendered Service Path (RSP) is the actual Service Chain. An RSP references an SFP, and effectively merges the information from the SFP and SFC to create the Service Chain. If concrete SF details were not provided in the SFP, then SF selection algorithms are used to choose one. When the RSP is created, the OpenFlows will be programmed and written to the SFF(s). Service Chaining Encapsulation encapsulates traffic sent through the Service Chaining domain to facilitate easier steering of packets through Service Chains. If no Service Chaining Encapsulation is used, then packets much be classified at every hop of the chain, which would be slow and would not scale well. The NSP is the Service Path ID. The NSI is the Hop in the Service Chain. The NSI starts at 255 and is decremented by every SF. If the NSI reaches 0, then the packet is dropped which avoids loop detections. NSH also has metadata fields, but that’s beyond the scope of this architecture. In ODL SFC, NSH packets are encapsulated in VXLAN-GPE. A classifier is the entry point into Service Chaining. The role of the classifier is to map incoming traffic to Service Chains. In ODL SFC, this mapping is performed by matching the packets and encapsulating the packets in a VXLAN-GPE NSH tunnel. The packet matching is specific to the classifier implementation, but can be as simple as an ACL, or can be more complex by using PCRF information or DPI. When using NSH with VXLAN tunnels, its important that the VXLAN tunnel is terminated in the SF VM. This allows the SF to see the NSH header, allowing it to decrement the NSI and also to use the NSH metadata. When using VXLAN with OpenStack, the tunnels are not terminated in the VM, but in the “br-int” OVS bridge. There is work ongoing in the upstream OVS community to implemement NSH encapsulation. To get around the way OpenStack handles VXLAN tunnels, the OVS work will also include the ability to encapsulate/decapsulate VXLAN tunnels from OpenFlow rules, instead of relying on the Vtep ports. The ongoing upstream OVS work will probably not be finished by the time OPNFV Brahmaputra is released, so a work-around has been created. This work-around will use a private branch of OVS that has a preliminary version of NSH implemented. This section defines requirements for the initial OPNFV SFC implementation, including those requirements driving upstream project enhancements. Deploy a complete SFC solution by integrating OpenDaylight SFC with OpenStack in an OPNFV environment. 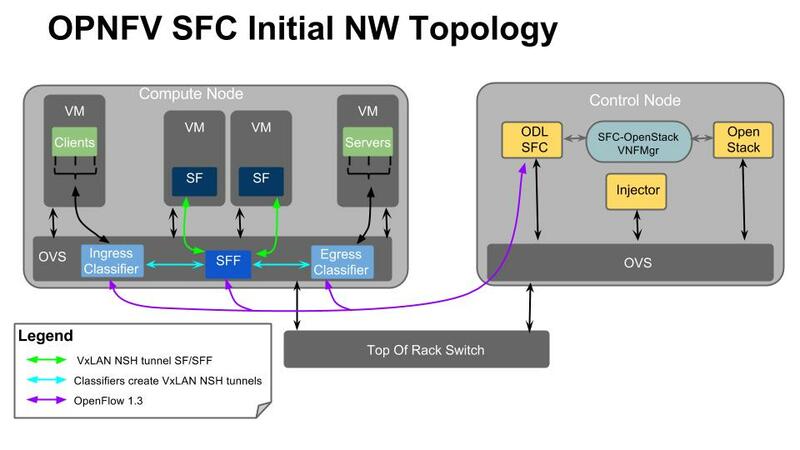 1 Placement of SFs on only one Compute node will be supported. 2 The supported Service Chaining encapsulation will be NSH VXLAN-GPE. 3 The version of OVS used must support NSH. 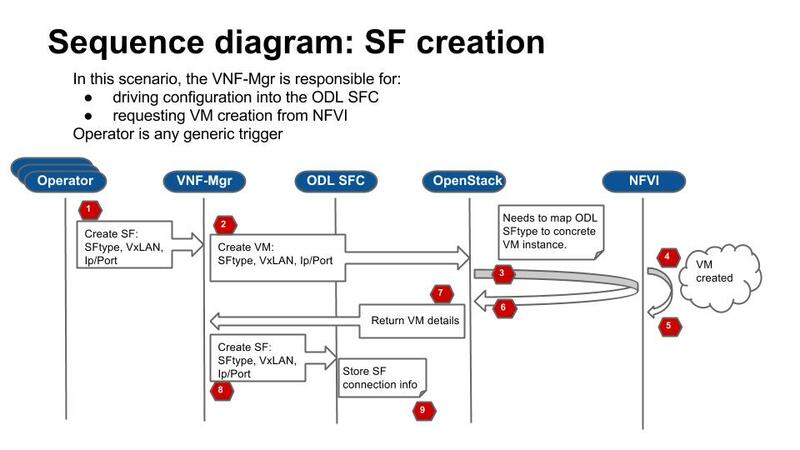 4 The SF VM life cycle will be managed by the Tacker VNF Mgr. 5 The supported classifiers will be either ODL Netvirt or ODL GBP. These requirements are out of the scope of the Brahmaputra release. 1 Placing SFs on multiple Compute nodes. 2 Dynamic movement of SFs across multiple Compute nodes.